Singapore, June 12 (IANS) US President Donald Trump shook hands with North Korean leader Kim Jong-un on Tuesday and welcomed the beginning of a "terrific relationship", a momentous step in an improbable courtship that has opened a new era for the worlds largest nuclear power and the most reclusive one. In a carefully choreographed encounter at around 9 a.m., Trump and Kim strode towards each other, arms extended, in the red-carpeted reception area of the grand Capella Hotel, in Singapore's Sentosa Island, reports The New York Times. This is the first time a sitting American President and North Korean leader have ever met. The two leaders then shared a 12-second handshake in the courtyard of the British-colonial style hotel against a backdrop of American and North Korean flags. Posing for photographs, Trump put his hand on the younger man's shoulder. Then the two, alone except for their interpreters, walked off to meet privately in an attempt to resolve the crisis over North Korea's nuclear programme. "I feel really great," Trump said. "It's gonna be a great discussion and I think tremendous success. I think it's gonna be really successful and I think we will have a terrific relationship, I have no doubt." Kim spoke in Korean, saying that "the old prejudices and practices worked as obstacles on our way forward, but we've overcome all of them, and we are here today". 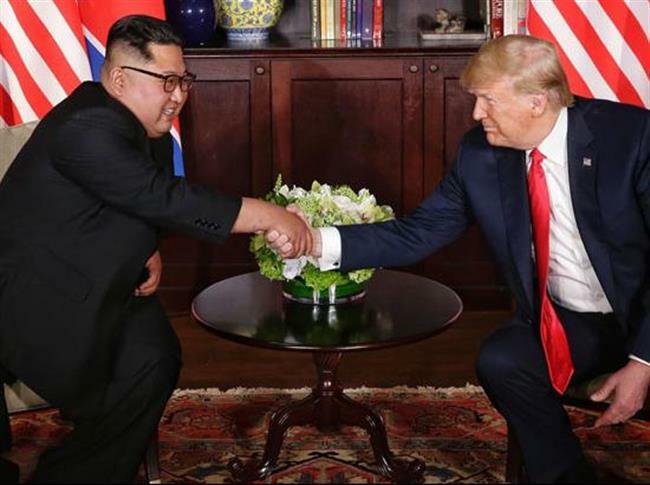 The goal of the summit was to ratify the outlines of a joint statement, to be released before the two men left Singapore later on Tuesday, that laid out a framework for additional talks, reports The Washington Post. After their one-on-one meeting which lasted for about 45 minutes, the two leaders were joined by senior aides for an expanded bilateral meeting and working lunch. Asked how the earlier discussion went, Trump said: "Very, very good," The Straits Times reported. On the US side, Trump's team included Secretary of State Mike Pompeo, National Security Adviser John Bolton, White House Chief of Staff John Kelly and US Ambassador to the Philippines Sung Kim. The North Korean delegation included Foreign Minister Ri Yong Ho, Vice-Foreign Minister Choe Son Hui and Vice-Chairman of the Central Committee of the ruling Workers' Party of Korea, Kim Yong Chol. The two delegations are sitting across a nearly 80-year-old, 4.3 metre-long teak wood table formerly used by the Chief Justice of Singapore in the daily administration of the court. It has been loaned by the Singapore National Gallery to the US Embassy. On Monday, North Korea's Choe and US Ambassador Sung Kim led a working-level meeting to finalise last minute details of the summit. The two leaders reached Singapore on Sunday followed by their individual meetings with Prime Minister Lee Hsien Loong. The summit, which was almost scrapped by a mercurial Trump last month, comes after a flurry of diplomatic activities and barrage of invective and insults traded between the US President and an equally aggressive Kim. While the US seeks complete denuclearization of the Korean Peninsula. Kim fears giving up of all nukes may invite an invasion by Washington. In 2017, Pyongyang fired off ballistic missiles and even conducted the most powerful nuclear test till date infuriating the US. Its sole ally China was left embarrassed. The summit also marks a diplomatic landmark between the two countries with a long history of tense ties. The 1950-53 Korean War ended without an official peace treaty. Previous US Presidents have made several attempts to get Pyongyang to give up its nuclear weapons, without success. Two major diplomatic efforts - an agreement in 1994 and the six-party talks in the 2000s - were ultimately abandoned, with both sides either failing to agree or accusing the other of not abiding by the terms of the agreements.